Whether you are a leader, a manager, a front-line staff or just one among the number of employees within your workplace, we are all prone to office politics at some point or another. The 'game' of office politics however, is mean. And the more prevalent it is in the workplace at the office or worst, widespread throughout the organization, the stronger the indication of other underlying problems, often times, rooted within leadership and the culture that they continually support. Needless to say, it speaks volume about the character, or lack thereof of such leaders. The truth is though, no one wins when it comes to office politics, especially if you are one who tries to get even or respond in ways that you brag about to someone else in the present, but would make you have regrets later on. On the other hand, you loose if you just do not know how to handle it at all. Either way, no one should have to go out to their workplace and have to live with this on a daily basis. I also believe that people should not give persons engage in office politics the time of day. But as an employee, what do you do? Do you get caught up in the game? Do you finger point and blame everyone else for the problems? Do you engage in the office gossip, the backstabbing, the sabotage, and the foot-dragging? Do you sit back and say, 'allow the chips to fall where the may.'? Do you get even with someone who, let's say made you look bad? 1.) "Repay no one evil for evil, but give thought to do what is honorable in the sight of all. If possible, so far as it depends on you, live peaceably with all. Beloved, never avenge yourselves, but leave it the the wrath of God, for it is written, "Vengeance is mine, I will repay, says the Lord." To the contrary, "if your enemy is hungry, feed him; if he is thirsty, give him something to drink, for by so doing you ill heap burning coals on his head" Do not be overcome by evil, but overcome evil with good." ~ Romans 12:17-21 ESV Whatever the circumstance, do good and leave it to God through your prayer because it is He ho will repay the other person in the end. 2.) "Be sober-minded; be watchful. Your adversary the devil prowls around like a roaring lion, seeking someone to devour." ~ 1 Peter 5:8 ESV There is a real enemy who comes to steal, kill and to destroy us. He would go the whole nine yards to make it possible even if he has to use someone else to do so. 3.) "Abide in me, and I in you, as the branch cannot bear fruit of itself, except it abide in the vine, no more can you except you abide in me." ~ John 15:4 KJV It is in the presence of God and that connection through His word that you will find that you are most restrained from lashing back at others and engaging in their sinful practices. 4.) "Let no corrupting talk come out of your mouths, but only such as is good for building up, as fits the occasion, that it may give grace to those ho hear." ~ Ephesians 4:29 ESV Do not share office gossip. Put yourself in the other person's place and you will understand how it feels to be talked bad about. 5.) "Do not complain, brethren, against one another, so that you yourself may not be judged; behold, the Judge is standing right at the door." ~ James 5:9 NASB Imagine the person you are talking about was right there in the room. It is simply not cool to talk about others, whether they are in the room or a million miles away. And be careful that you yourself is not place under the microscope for the same things that you are judging others about. 6.) " 'You shall love your neighbor as yourself.' There is no other commandment greater than these." ~ Mark 12:31 ESV The person who is creating the conflict is just as much your neighbor as the one who is promoting peace. Love them nonetheless, for by this others would be able to identify you as a true disciple of Jesus Christ. 7.) "You have heard that it as said, 'an eye for an eye and a tooth for a tooth.' But I say to you, 'Do not resist the one who is evil. But if anyone slaps you on the right cheek, turn to him the other also." ~ Matthew 5:38-39 ESV There are times when your best bet at winning would be to let others think that they are ahead of you. Let them be - they speak ill about you, love them, and neutralize their actions with kindness and charm. 8.) "God blesses those who work for peace, for they will be called the children of God." ~ Matthew 5:9 NLT Always strive for peace, not war and strife. As Christ is the Mediator between God and man, you too have a responsibility to promote reconciliation and peace between others instead of fanning the flames. 9.) "Do nothing out of selfish ambition or vain conceit. Rather, in humility value others above yourselves, not looking to your own interests but each of you to the interests of the others." ~ Philippians 2: 3-4 NIV When you do things, do not do not let selfishness or pride be your guide. Keep others in mind, listen to them and make people feel heard rather than argued with. 10.) "Wherefore, my beloved, as you have always obeyed, so no, not only as in my presence but much more in my absence, work out your on salvation with fear and trembling." ~ Philippians 2:12 ESV As Christ is our prime and greatest example, we must also let the same mind be in us. Do not expect the boss to intervene as often times, they step back and allow the politics to play out. 11.) "Brothers, if a person is doing something wrong, those of you who are spiritual should restore that person gently. Watch out for yourself so that you are not tempted as well." ~ Galatians 6:1 ISV Help others win while you win too. If someone is engaged in wrongdoing, restore them gently, not in a prideful way as if you are without any fault of your own. 12.) "Therefore, as God's chosen people, holy and dearly loved, clothe yourself with compassion, kindness, humility, gentleness and patience. Bear with each other and forgive whatever grievances you may have against one another. Forgive as the Lord forgave you. And with all these virtues put on love, which binds them all together in perfect unity." ~ Colossians 3:12-14 For some this may be difficult, but make every effort to build healthy relationships across the organization. The person you may be counting on is the very one that may be gone tomorrow. Was this post helpful to you? 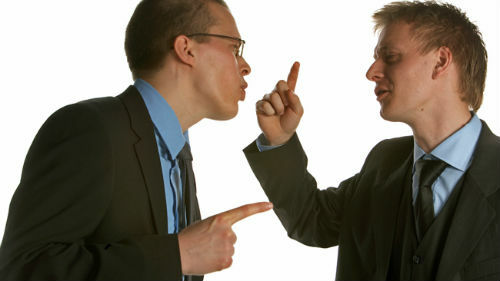 Have you ever been caught up in office politics and if so, how did you resolve or respond to it? Let us hear your thoughts in the comment form below.